They say laughter is the best medicine. If that's true, then Harley Quinn is the Chief Physician, Dentist, and Tree Surgeon of Super Hero High School. 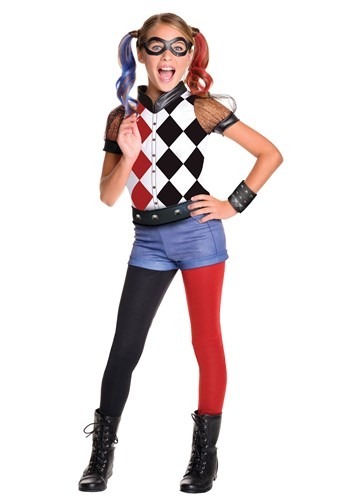 Your little prankster can cause some fun mischief of her own in this Deluxe Harley Quinn Costume, from the DC Superhero Girls cartoon! Harley may seem a little disorganized, but her goofy style totally works, and it makes this a fun costume to clown around in. The stylish top is printed with a black and red "harlequin" pattern (Ha! We just got that!). Since Harley is such a talented gymnast and incorporates acrobatic moves into her pranks, she never goes anywhere without her trademark half black-half red tights and shorts. Top this outfit off with the included bandit mask, arm cuff, and colorful hair attachments, and your little joker will be ready to brighten all her super-classmates' days! Things can get pretty rough, at times, for the girls at Super Hero High. In addition to the normal stresses of tests, homework, and making new friends, they have special powers and skills that they are still learning to control. Luckily, they have their ol' pal Harley around, who is willing to go to any lengths to put a smile (or pie) on everybody's face! She's always quick with a joke or "punny" comeback to lighten the mood, and as a seasoned practical jokester, she's the undisputed queen of class-clownery. While she has been known to occasionally take jokes a bit too far (especially when her trusty giant mallet is involved), she cares about her friends, and just wants them to have a good time! Received my daughters costume in the mail yesterday. Shipped fast! We ordered a large for my 9yr old daughter and are really happy with the costume. The shirt and accessories fot perfect, however the bottoms are too big. Other then that great costume! Was this review helpful to you?YesNo5 people thought so and 1 didn't. My daughter is 9, usually wears a youth medium, or size 8/10. We tried the medium of this costume. the pants fit great, but the shirt was way too small, we couldn't even get the velcro closed and the sleeves were too tight. Tried the large, and the shirt fit, it was roomy, so for a cold night we could fit a layer under it, but, the bottoms were ridiculously too large. everything was as described! very impressed with this costume and with this company!!! Will barely close in the back. I'm pretty sure the Velcro won't stay closed for Halloween.